Here are 7 reasons why butter is good for you. I’m not going to make a big deal out of A and E. If you’re eating a healthy dietthat includes animals and plants then you are probably getting enough of those already. But I do want to talk a bit about Vitamin K2, which is fairly rare in the modern diet and many people don’t know about. Vitamin K2 can have powerful effects on health. It is intimately involved in calcium metabolism and a low intake has been associated with many serious diseases, including cardiovascular disease, cancer and osteoporosis (1, 2, 3). Dairy from grass-fed cows is particularly rich in Vitamin K2 (4). Bottom Line: Butter contains a lot of fat-soluble vitamins. Grass-fed butter is particularly rich in Vitamin K2, which can have powerful health benefits. The “war” against saturated fat was based on bad science. It was never really proven that it caused any harm. In fact, recent studies suggest that there is no association at all between saturated fat and cardiovascular disease (5, 6). Saturated fats raise HDL (the good) cholesterol and change the LDL from small, dense (very bad) to Large LDL… which is benign (7, 8). Additionally, butter contains a decent amount of short and medium chain fats… which are are metabolized differently from other fats. They lead to improved satiety and increased fat burning (9, 10). Bottom Line: New studies show that there is no association between saturated fat and heart disease. Butter contains short- and medium chain fats. Mainstream nutrition guidelines tend to backfire and have the opposite effect of what they were intended to do. A prime example of that is the recommendation to replace butter with margarine… which is something our beloved authorities have been telling us to do for a long time. Well, what happened is that we replaced butter, a healthy food, with something containing highly processed trans fats… which are downright toxic and cause all sorts of diseases. In the Framingham heart study, they examined the effects of butter and margarine on cardiovascular disease (11). Margarine significantly increased the risk of cardiovascular disease, while butter had no effect. Another study revealed that high-fat dairy consumption reduced the risk of heart disease by a whopping 69%, most likely due to increased Vitamin K2 intake (12). 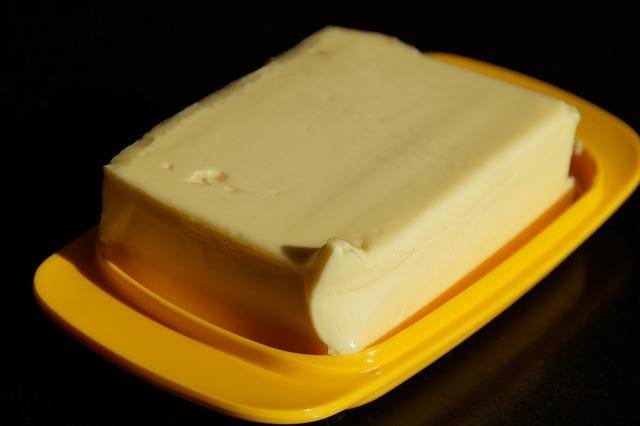 Bottom Line: Margarine raises heart attack risk, while natural butter does not. Grass-fed butter may even reduce heart attack risk due to the high Vitamin K2 content. The 4-carbon fatty acid butyrate is created by bacteria in the colon when they are exposed to dietary fiber. This may be the main reason fiber has health benefits for humans. But there is another good dietary source of butyrate… butter, which is about 3-4% butyrate. In fact, butyr-ate derives its name from butter. In rats, butyrate supplementation prevents weight gain on an unhealthy diet by increasing energy expenditure and reducing food intake. It also improves the function of mitochondria and lowers fasting triglycerides and insulin (13). In humans, butyrate is anti-inflammatory and has powerful protective effects on the digestive system (14, 15, 16, 17). Bottom Line: Butter is an excellent source of the 4-carbon fatty acid butyrate, which can have various health benefits. Butter, especially grass-fed, is a great source of a fatty acid called Conjugated Linoleic Acid. This fatty acid has powerful effects on metabolism and is actually sold commercially as a weight loss supplement. CLA has been shown to have anti-cancer properties as well as lowering body fat percentage in humans (18, 19, 20). However, some studies on CLA show no effect on body composition (21). Bottom Line: Grass-fed butter contains Conjugated Linoleic Acid (CLA) which has been shown to improve body composition in several studies. The nutrition authorities often recommend that we choose low-fat dairy products. That way, we can get the calcium we need without all those “bad” fats and calories. But despite the higher calorie content, eating high-fat dairy products is NOT associated with obesity. In fact, a new review paper came out in 2012 that examined the effects of high-fat dairy consumption on obesity, cardiovascular disease and other metabolic disorders. They discovered that high-fat dairy did NOT increase risk of metabolic disease and was associated with a significantly reduced risk of obesity (22).